In a tweet, Trump referred to Brown as "Moonbeam," a nickname a newspaper columnist coined for him in the 1970s. Trump then listed the ex-convicts' crimes; they included misdemeanor domestic violence, drug possession, and kidnapping and robbery. In a news release about the pardons on Friday, the governor's office said that "those granted pardons all completed their sentences years ago and the majority were convicted of drug-related or other nonviolent crimes." Brown's pardons don't automatically stop deportation proceedings, but eliminate the convictions on which authorities based their intentions. 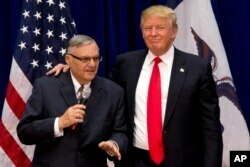 FILE - Donald Trump, then a Republican presidential candidate, is joined by then-Maricopa County, Ariz., Sheriff Joe Arpaio at a campaign event in Marshalltown, Iowa, Jan. 26, 2016.